This one tops them all… Grandpa Fjordbak’s birthday falls during Christmas week, so while we were visiting him at the nursing home where he stays, they had a birthday party en masse for all the birthdays that occur during the month of December. 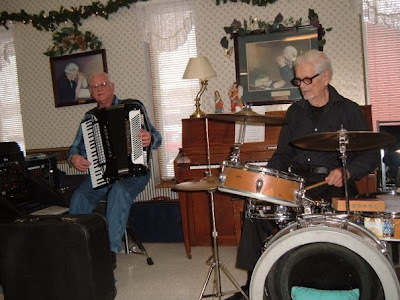 It was celebrated with your typical fruit punch and cake in the dining hall, but the best part of the event was the entertainment they hired out for the afternoon… “Bud And Vern”, the local polka band. It was a truly Norwegian afternoon….